It is widely observed that the study of war has been paid limited attention within criminology. This is intellectually curious given that acts of war have occurred persistently throughout history and perpetuate criminal acts, victimisation and human rights violations on a scale unprecedented with domestic levels of crime. However, there are authoritative voices within criminology who have been studying war from the borders of the discipline. This book contains a selection of criminological authors who have been authoritatively engaged in studying criminology and war. Following an introduction that ‘places war within criminology’ the collection is arranged across three themed sections including: Theorising War, Law and Crime; Linking War and Criminal Justice; and War, Sexual Violence and Visual Trauma. Each chapter takes substantive topics within criminology and victimology (i.e. corporate crime, history, imprisonment, criminal justice, sexual violence, trauma, security and crime control to name but a few) and invites the reader to engage in critical discussions relating to wars both past and present. The chapters within this collection are theoretically rich, empirically diverse and come together to create the first authoritative published collection of original essays specifically dedicated to criminology and war. Students and researchers alike interested in war, critical criminology and victimology will find this an accessible study companion that centres the disparate criminological attention to war into one comprehensive collection. 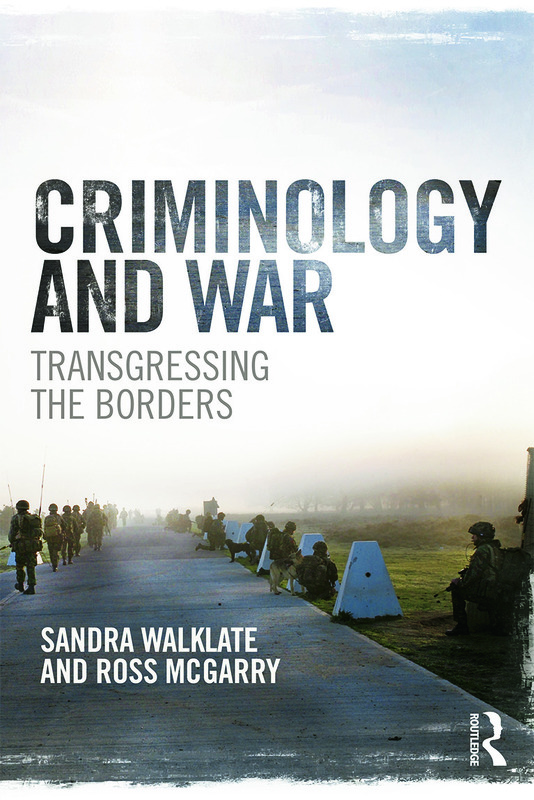 Introduction: Placing War within Criminology, Ross McGarry and Sandra Walklate Part 1: Theorising War, Law and Crime 1. War and the death of Achilles, Vincenzo Ruggiero 2. Civilising the Corporate War, David Whyte 3. Criminology and War: Can Violent Veterans See Blurred Lines Clearly?, Emma Murray Part 2: Linking War and Criminal Justice 4. War as an opportunity for divergence and desistence from crime, 1750-1945, Zoe Alker and Barry Godfrey 5. Through the lens of war: Political imprisonment in Northern Ireland, Ruth Jamieson 6. Veteran Coming-Home Obstacles: Short and Long-Term Consequences of the Iraq and Afghanistan Wars, William Brown Part 3: War, Sexual Violence and Visual Trauma 7. Sexual and Sexualized Violence in Armed Conflict, Christopher W. Mullins and Nishanth Visagaratnam 8. Normative visibility and artistic resistance to War, Wayne Morrison 9. Competing for the ‘Trace’: The Legacies of War’s Violence(s), Sandra Walklate and Ross McGarry Postscript: From the criminalisation of war to the militarisation of crime control, John Lea. Sandra Walklate is Eleanor Rathbone Chair of Sociology at the University of Liverpool and is internationally recognised for her work in and around criminal victimisation, particularly the fear of crime. She has written extensively with Ross McGarry and Gabe Mythen on risk, resilience and cultural victimology and in 2014 received the British Society of Criminology’s award for outstanding achievement. Ross McGarry is Lecturer in Criminology within the Department of Sociology, Social Policy and Criminology at the University of Liverpool. He has previously conducted research with British soldiers from the war in Iraq and is currently engaged in research on British military repatriations. He is the author and co-author (with Sandra Walklate) of other forthcoming texts, including Victims: Trauma, Testimony and Justice from Routledge and the Palgrave Handbook on Criminology and War.